At a time of escalating wars, terrorism and repression, CPD’s initiatives in support of democratic and social justice movements and promoting a democratic, peaceful U.S. foreign policy could not be more essential. To sustain our efforts, we need your help. Thanks to your generosity, we’ve supported the campaigns below over the past year. We’re asking for your support to continue our work in the challenging year ahead. In September CPD urged people to attend a rally "NYC Solidarity with Syrian Refugees." We declared our support for Syrians fleeing from war and the brutality of both the Assad regime and the Islamic State, and our solidarity with Syrian, Palestinian, Iraqi, Yemeni, Afghan and all refugees. CPD has endorsed a demonstration to take place Thursday, December 10 at 5pm at Columbus Circle in New York City, right by the International Trump Tower, in support of Syrian and Iraqi refugees, and to demand that the U.S. accept more than the announced 10,000 Syrian refugees. This demonstration is especially urgent in light of Donald Trump’s despicable anti-Muslim statements. Media advisory, Facebook page “Human Rights TRUMP Oppression: Solidarity with Iraqi and Syrian Refugees” We hope you can join us if you are in or around NYC, and please alert your friends even if you are not in the area! In November, CPD asked our supporters to sign an on-line petition to French president François Hollande, calling on him to lift the ban on climate protests at COP 21. CPD distributed the November statement of France’s New Anti-Capitalist Party, “The cruelty of imperialist wars results in the cruelty of terrorism,” which denounced the scapegoating of Muslims and demanded that the state of emergency be lifted. In August we sent our supporters a message: “Why Support the Iran Deal,” which featured a piece by Steve Shalom, followed by CPD’s still-pertinent statement against the 2013 Nuclear Weapon Free Iran Act. We also included the finding of the International Campaign for Human Rights in Iran study that a cross-section of Iranian civil society supported the Iran deal. We published an account of the explosive Greek protests on November 12. In September we publicized a forum bringing together activists from three countries, “Greece, Spain & Puerto Rico: Current Struggles and Building Solidarity,” Despina Lalaki, Vicente Rubio-Pueyo, and Rafael Bernabe who discussed the struggles of their countries with debt and austerity. In September we publisheda call from five prominent Europeans calling for a break with austerity Europe. The five were Jean-Luc Mélenchon, Stefano Fassina, Zoe Konstantopoulou, Oskar Lafontaine, and Yanis Varoufakis. In July CPD circulated a fund appeal for Greece’s “Solidarity for All," which has sustained people during the years of austerity. CPD co-sponsored the group’s June U.S. tour. In May we responded to another Greek appeal, this time for signatures on the Appeal to Support the Resisting Greek People and its Truth Commission on Public Debt. In May CPD and other groups sent an open letter to Alexis Tsipras, expressing solidarity with the Greek people while noting dismay at a photo of him shaking hands with Egypt’s dictator, President Abdel Fattah al-Sisi. Expanding on the strategic debate featured in our February forum, in March we prepared for The Nation magazine a special discussion of the options facing Greece. 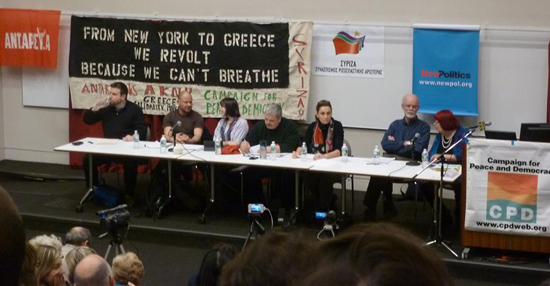 In February we organized a major, well-attended public forum, “After the Greek Elections: The Future of Austerity in Greece, Europe and Beyond,” with speakers from a range of left perspectives -- Nantina Vgontzas, Natassa Romanou, Iannis Delatolas, Aaron Amaral, and Alan Akrivos -- foreshadowing many of the controversies that subsequently emerged. In February CPD joined with others in a demonstration at the Delegation of the European Union to the U.N., which was meeting in Brussels to discuss the Greek debt question. In February we circulated a CPD sign-on statement “We Support the Greek People’s Struggle against Austerity,” and sent it to the European Commission, European Central Bank and International Monetary Fund. In May CPD co-sponsored a talk by Richard Roman, co-author with Edur Velasco Arregui of Continental Crucible: Big Business, Workers and Unions in the Transformation of North America. CPD promoted a June rally in solidarity with Egyptian political prisoners called by MENA Solidarity Network-US, Egyptian Solidarity Initiative in London, and activists in Egypt.